Our application is conveniently located online for you to complete at your own pace. There is a $35, non-refundable fee. Submit an up-to-date version of your resume or CV. Briefly discuss a current global issue, including why you consider it important and what you think should be done to address it. Your writing sample should be no longer than 500 words. Please send official high school transcripts or GED certification to the Georgetown SCS Admissions Office. 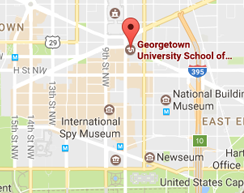 Transcripts should either be mailed in an envelope sealed by the school, or emailed via an official online transcript provider to scsadmissions@georgetown.edu. The Bachelor of Arts in Liberal Studies program honors up to 64 transfer credits for completed courses with a minimum C grade from regionally accredited institutions. Transfer credit evaluations are conducted on a case-by-case, individual basis by the program. Factors considered when reviewing transfer credit include, but are not limited to, accreditation, timeliness of content (computer science and technology courses no older than 10 years), and overall academic relevance within the program. In addition, CLEP exam credit, AP exam credit (grade of 4-5), and all Joint Services Transcripts will be considered for transfer. Students applying to the program who have previously attended another Georgetown University undergraduate program should be aware that their entire undergraduate academic record will be reflected on their transcript. This means that all courses, grades, and credits earned at Georgetown University will be factored into the cumulative GPA and credit totals, without exception. While all previously completed undergraduate coursework will be reflected on the transcript and will be applied towards the cumulative GPA and credit totals, students are still responsible for completing all of the program requirements, including a minimum of 57 credits within the program and all required courses. Undergraduate coursework at Georgetown University is reading- and writing-intensive and requires proficiency in written and spoken English.